Red shift … red shift … it’s all because of the RED SHIFT! You hear it mentioned so often, but what does it mean? It’s got something to do with the idea that the Universe is expanding … but what? Ok, all will now be revealed. Here’s what the red shift is all about. Astronomers have observed that the light coming from distant stars is redder than they would expect. The change of colour is called the Red Shift. If scientists are right and the Universe is expanding, why would that lead to the Red Shift? It’s tricky to explain, but the first thing to know is that light travels through space as a wave. A tightly squeezed wave corresponds to a blue colour of light. A more stretched out wave corresponds to redder colour of light. The second thing to know is that if a light source is moving away, then this has the effect of stretching the waves of light from that source. You can hear something similar happening when a car passes you by. 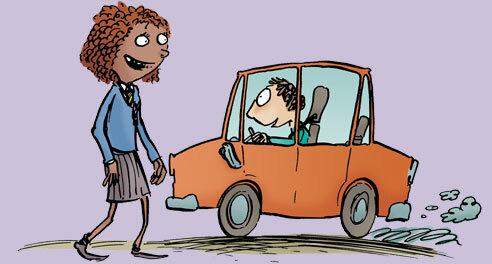 The sound shifts in pitch as the car passes – so it goes something like this: ‘eeeeeeaaaowwww’. This shift happens because the sound waves are more bunched up as the car comes towards you and are more stretched as the car moves away. But the red shift is something to do with light, right? That’s right. If the stars are moving away, when their light reaches us, we would expect to see a redder colour of light. 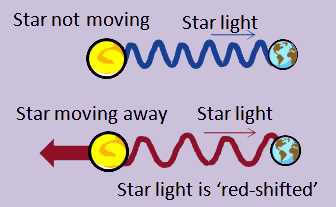 This isn’t the only reason that light might be red-shifted, but it does fit the observation. Scientists say that devising theories to fit observations and looking for observations to test theories are some of the reasons why science is exciting.